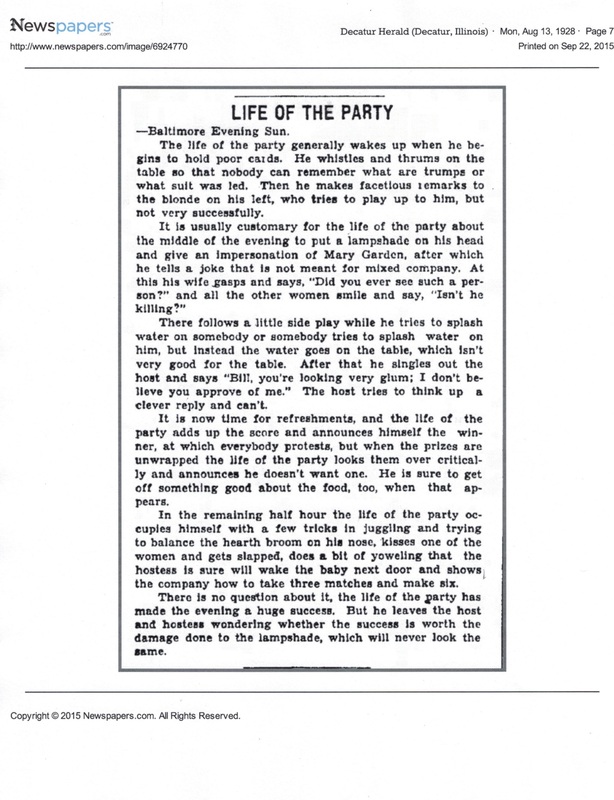 We’ve all seen the “life of the party” at a gathering or two. 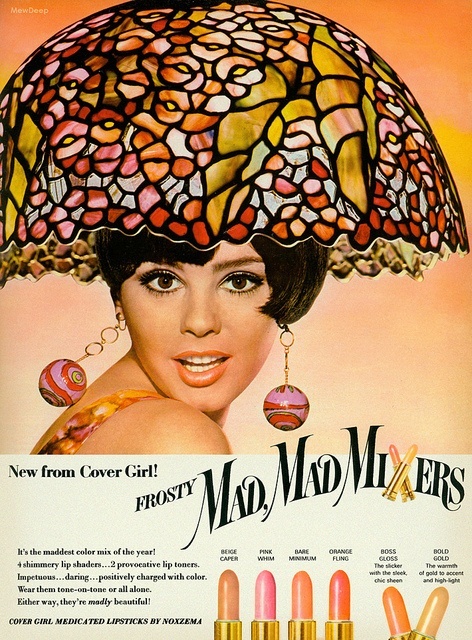 The teller of jokes, the keeper of magic tricks, the dancer of jigs, the wearer of a lampshade…which brings us to this 1966 CoverGirl advertisement for Frosty Mad Mad Mixer lipsticks, in which the woman in the picture is wearing a Tiffany lampshade on her head (à la the life of the party perhaps?). Maybe this ad is meant to dazzle you with color by comparing lipstick to the visually dynamic art work in a Tiffany lamp, which at that time was regaining artistic merit and popularity among art collectors. In fact, the first museum exhibitions of Tiffany glass were mounted in 1955 and 1958 at the Morse Gallery of Art in Winter Park, Florida, and the Museum of Contemporary Craft in New York City, respectively. And let’s not forget that it was in 1961 that the movie Breakfast at Tiffany’s debuted, bringing the Tiffany name, albeit the retail store, to the height of popular culture. Or, perhaps this ad reflects the new CoverGirl: an artistic and modern “life of the party,” who wears these “mad” colors and sticks a lampshade on her head to be fun and free and sassy. Thankfully, the real, stunning Begonia Lamp by Tiffany Studios was never actually worn on someone’s head (as far as we know), and it can be seen in person in its full life-of-the-party glory in the Winterthur Galleries as part of our exhibition Tiffany Glass: Painting with Color and Light. This exhibition was organized by The Neustadt Collection of Tiffany Glass in New York City. We hope you’ll come see it! This entry was posted in American Culture Studies, Decorative Arts, Design, Exhibitions, House and tagged 19th century, du Pont, H. F. du Pont, Henry Francis du Pont, HF du Pont, Tiffany, Tiffany Glass: Painting with Color and Light, Tiffany Studios, Winterthur, Winterthur Galleries, Winterthur Program in American Material Culture. Bookmark the permalink.